Senseless Sunday preaching again - or existence dictates a Sunday story: I'm utterly tired of these mutual advertisings and delight devices like for better behaviour, to ‘reach esoteric goals i.e. enlightenment’! 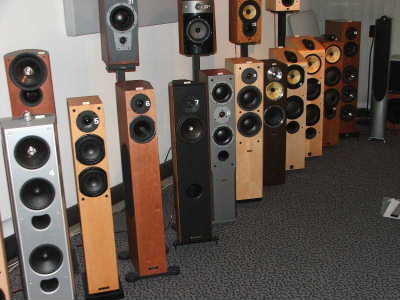 My mind is highly engaged, to explore the speaker market. The factories send their information material. I watch auctions in eBay. When I relax in my armchair after work, my mind and heart and fantasy calms down. Music from all over the world and from many, many centuries bring joy and peace. Tired of the ‘Outer World’ the joy of being unfolds in an ‘Inner World of Music’. Maybe I should start to play piano again. Sitting in my swinging armchair I listen to our World's music, sip a tiny glass of noble red wine from France or sunny regions of Germany and slowly get ready to sleep. TV entertains with these cruel criminal films – to catch the attention of a warrior’s mind. We have seen a movie on Friday: Al Gore, 2000/2001 nearly President of the U.S., lectures about the ongoing climate catastrophe: ‘’An unconvenient truth’’. Everywhere people know, how to change themselves and how to change the world. I definitely don’t know! But one fact is felt crystal clear: we both, Mima and I relax in our beautiful nourishing Mother Nature. So we drive 100 Kilometres on our sunny Sunday to the ‘’Maple Grounds’’. Autumn changes colours of trees in fiery glory. Thousands of people recreate in this natural theatre. We need two hours in the traffic jam, to return home after a rest in one original Bavarian restaurant. Mima drives, I sleep in the car on the high way. After a shower and ten hours deep sleep we are ready to fight a new week in our work.